The idea of the concert program 300 Years of Mykola Lysenko and Kyrylo Stetsenko came from the Honored Artist of Ukraine violinist Kyrylo Stetsenko Jr., the grandson of Lysenko’s best student, the famous musician Kyrylo Stetsenko Sr. The Exclusives concert series, celebrating 2012 as a double anniversary of two Ukrainian music classics, Lysenko’s 170th, and Stetsenko’s 130th, premieres today at the Actors’ House at 7 Yaroslaviv Val Street in Kyiv at 7 p.m. Lysenko’s granddaughter, People’s Artist of Ukraine and the Tchaikovsky National Academy of Music professor Rada Lysenko will be the special guest of the artistic program. She is to play Stetsenko’s work for piano Testament, while Stetsenko Jr. will perform Lysenko’s violin piece Elegy. Hanna Solonychna, a soprano, will sing romances by the two Ukrainian classical composers for the program’s audience. The Culture web portal adds that the program will include not just well-known compositions, but also Lysenko’s Dream/At the Honey Feast’s remake for three pianos authored by the composer himself which will be performed for the wider audience for the first time. By the way, the composers’ grandchildren will be among the three pianists. The news about the upcoming concert broke on November 29 when Stetsenko and Lysenko were guests of Mykola Kniazhytsky’s program on TVi. The talented grandchildren’s interesting and frank discussion of their great ancestors as well as general problems of the Ukrainian classical music and the state’s role in its promotion became a nice present for the Ukrainian TV audience from the TV industry. It would be more correct to describe it as a glimpse into what real public interest news broadcasts should always be. Having watched The Evening with Mykola Kniazhytsky, one realizes that this program is what one may call a quality TV production, but the likes of it are virtually absent from our channels. 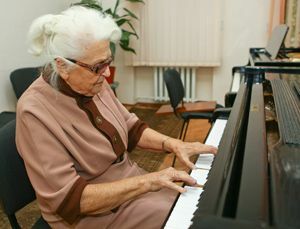 Otherwise, we would see and hear much more often on the national TV people like Lysenko who, despite her advanced age, continues to not only play, but also teach students at the Tchaikovsky National Academy of Music.